The dictionary defines adventure as an unusual and exciting, typically hazardous, experience or activity. That pretty much sums up our life, because I truly believe when we trust Jesus and step out of our comfort zone in obedience it is unusual, exciting and (more often than not) … hazardous. These past few years have been an over-the-top series of adventures that included new jobs, new schools, planting a church, moving onto a houseboat, and ending up homeless after a fierce storm. (We did say “hazardous”, right?) If you aren’t caught up on the Petri-adventure-saga you can find all the details in earlier posts. Maybe make some popcorn first. 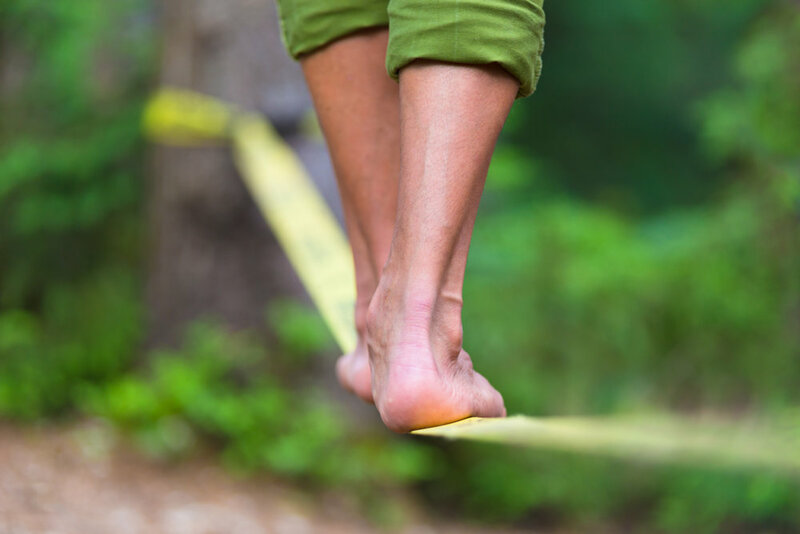 Maybe you relate to this: Imagine a tightrope walker, slowly and steadily moving forward in an attempt to maintain balance. One foot at a time, navigating life without falling. This is how I feel, attempting to find balance in my current season of life. (Ever been there?) I often feel overwhelmed at this stage, so it feels crazy for God to call me to a NEW adventure while I’m still right in the middle of my balancing act. It’s like someone tosses you a ball while you’re on the tightrope and expects you to catch it and keep moving forward without losing your footing. Crazy, right? Crazy AND hazardous, yes. However, as I’ve walked with God I have learned a few things: first His ways are always better than my ways (Isaiah 55:8-9) and if He calls me to it he will equip me for it (Hebrews 13:21). I am confident of these truths. So, ready or not, here we go. I’m about to step into a world I’ve admired from a distance, but never had any desire to be a part of: Homeschooling. (Those of you who know me well are probably shaking your head in disbelief because, truly, this is so unlike me). I struggle with patience and never paid attention in school. I’m fairly confident that in most areas of education I am NOT smarter than a fifth grader. Confession: The other day I had a moment where I thought Idaho was in the Midwest – so my kids may be in real trouble here, at least in geography. Why now? Why this? If it’s going to be a struggle then why add it to my already overflowing plate? The answer is simple: Because I believe this is what is best for my family. They are my first God-given ministry. My daughter Maddie is eleven years old and struggles with dyslexia. The gap between her and her peers is growing bigger, but she keeps getting pushed through. She comes home with work she did not complete in class because her pace is slower and then has homework on top of that, so as you can imagine, our evenings are filled with stress and tears. She has begged to be homeschooled for years, but I dismissed it because I didn’t think I was cut out for it. (I still don’t.) But when I recently had a discussion with a group of my friends who are homeschooling moms I began to actually consider it. I prayed. I researched. Honestly, I knew. This is something I have to try for our family. We gave Noah the choice as well and he has also chosen to continue his education at home. So, the adventure begins this fall! As I prepare for this journey I am both optimistic and absolutely terrified. I am hopeful that this is going to be a blessing for our family. The flexibility is a benefit, as is the increase of quality time together. The online curriculum will allow me to get my work done right alongside them, and jump in and help where needed. I have been researching, organizing and praying and I have a peace in my spirit that this is the right decision for our family. As I share our decision with friends and family, a few themes of common concerns arise. First, what about the kids’ social lives? This one actually makes me laugh. (Like, are you serious? Have you met our family or our kids?) If anything, my kids are OVERLY socialized and could benefit from more family-only down time. The second most common concern is that they are going to be too sheltered. Brutal truth: My kids have shared with me that kids are vaping in bathrooms, selling condoms, bullying one another, publicly drinking and smoking on social media, and so much more. (These are middle school students!) While I know I cannot shelter them from everything, I can limit their exposure to the things of this world. The truth is they are exposed to more than enough between television, social media, the lake, their sports teams and even church which is a hospital for broken people. I don’t think we could shelter our kids even if we wanted to in our culture today. But we can take ownership for the rate of exposure to some very mature topics, especially in an academic setting. I am currently sitting in the lobby of my hotel in Jerusalem, thinking of you all. It has been a long day, and while my body longs for sleep, my mind is awake and racing with the adventures and discoveries of the day. It’s hard to process this experience. I imagine when I return home I will be bombarded by questions about my journey and honestly, I am not sure what I will say - words are inadequate for a job this big. How will I describe how the Word of God came alive to me here? Like pieces of a puzzle, up until now I’ve only been able to see partial images, but because of this trip I see how the entire puzzle fits together. It’s a breathtakingly beautiful picture and I am not sure there are words to communicate how being here touches deep places in my soul. Right now, I am focusing on being in the moment with Jesus - receiving what he has for me here in this Holy place. But I also look forward to the day I can find those elusive perfect words to describe my encounters with Him here, in His land. Until that day, I go to bed both missing my family like crazy and incredibly grateful for this experience. I stood in my front yard surveying the damage. There was no denying it: We had been attacked. As is usually the case with attacks, I simply didn’t see it coming. But while we were sleeping, a group of pranksters targeted our home and showered it in toilet paper. Little did I know, this was just the beginning of a prank war that would leave me tired, without a tooth brush and forever checking my food for fake cockroaches. Though I lost this particular battle I did learn a few lessons along the way. First and foremost, while my story is about a prank war between friends, we all have an enemy that has waged war on our soul. Here’s the truth: He has come to kill, steal and destroy, not to play friendly pranks. His methods are not innocent nor are his attacks harmless. Like my friends that came in the darkness of night to toilet paper our house, our enemy also comes when we least expect it. I recently heard Pastor Zane Anderson say that it is important to always be in awe of Jesus but also to be aware of the enemy. If we hope to win this spiritual battle, we must be prepared at all times, and learn to recognize the enemy’s attempt to discourage, distract and destroy us. My friends’ pranks were relentless. I found that I was so focused on all the real life tasks I had to accomplish that I didn’t have time or energy to engage in their little war. Therefore, as the hits kept coming, I was unable to fight back. In much the same way the enemy’s attacks are strategically relentless. He knows how to distract us from Jesus, make us question our call and forget our mission to reach the lost. When we are weary from life, we are also too tired to engage in battle. And it’s in this very weariness that it’s easy to forget we have a God that is willing to fight for us. When we fight spiritual attacks out of our own strength and knowledge, we are playing right into Satan’s hand. He would love nothing more than for us to fight back on our own, to respond out of our ever-changing emotions and to react in a way that inevitably causes more damage than good. I don’t want the enemy to gain ANY ground or cause any more damage to this world or the body of Christ, so I am determined to keep my eyes on Jesus. When we do this, we enlist the help of God, who is far stronger and able to fight much more effectively than we ever could – He has already won the war, on the cross. At the end of this little prank war I had the opportunity to call out these pranksters and expose their schemes. I didn’t. Instead I chose to bless them. Granted it was only with an Amazon gift card (that they will most likely use for more supplies to prank me), but I blessed them nonetheless. God is glorified every time we repay evil with good. If we want to win the spiritual battles that constantly wreak havoc in our lives, our families and our churches we must choose to respond in love. Jesus displayed the ultimate act of love when he died on the cross for our sins – and focusing on that truth is the key to winning each and every battle. I miss the water. Don’t get me wrong - I am grateful to be back in a home on land, but there was something about being surrounded by water that soothed my soul. The weeks following the storm I was repeatedly drawn to the lake. I found myself driving out of my way to the marina just to sit in my car and look at the water. In these moments, even though our world was upside down, I felt peace. Going to the lake on a daily basis is out of the question, so I decided to bring the water to me. First, I got a water bed. (Not really, as I am pretty sure they stopped making those in the nineties, but I did consider it…) A pool is out of the question because it requires a yard (which we don’t have), so instead, I bought a little fountain for my bookshelf. Not quite the same, but it will probably fill the void, right? In a soul-searching moment this past weekend, God showed me that my longing for water has less to do with the lake and everything to do with Jesus. The lake had become a place of escape. A place where I could meet with God because I expected to find him there. A place of peace in the midst of life’s storms. That is, until life’s storms became more than just a metaphor and we found ourselves out of a home, sharing a rental with friends, living out of suitcases, planning a major women’s ministry event and planting a church. In the chaos, I longed for the water because my spirit was dry. Then, a few weekends ago, my dry spirit found living water all over again. In spite of our demanding schedules and never ending to-do list, we packed our bags and headed to Tucson for a special retreat. The invitation had come months ago and I knew even then that we were meant to go. The event was hosted by Pastor Zane Anderson, his wife Jan and their amazing team. The entire weekend we were pampered, poured into and prayed over. The Holy Spirit showed up in a powerful way and God’s Word spoke directly to our soul. I took 25 pages of notes and cried too many tears to count. Most of the truths that I frantically jotted in my journal were personal and I’ll keep those little treasures for myself. However, there was one verse that Pastor Zane spoke over us that I want to share. I’ve finally come to terms with the fact that my $9.99 water fountain from Walgreens won’t fill the void. When I have a void in my life, a wound that needs healed, or a spirit that needs refreshed Jesus is the answer. He is the living water! One year ago, we stepped out of our comfort zone and into a houseboat. God called us to downsize, sell everything and simply to follow him. He didn’t tell us where we were going, but we knew he was guiding our steps. With an act of blind faith, our adventure began. Ten months ago: We realized that life on the lake can be cold (even in Arizona!). We spent our evenings huddled around space heaters and learned to store blankets by the front door for our golf cart commute to and from the car. Chilly nights, no space for an actual Christmas tree and (very) cold showers made winter on the lake more than a bit challenging. Nine months ago: God gave us a burden for our community and we decided to plant a church. Slowly, the pieces of our story began coming together as God revealed His plan. The lake became a haven for us where we could be still, pray and wait for God’s direction. Seven months ago: We bought a dining table for our back patio. We spent many mornings at that table, overlooking the water, drinking coffee and studying the Bible. In the evenings, we enjoyed our dinner outside as we watched sailboats cruise by. With the cold (finally!) behind us, we began to enjoy the great outdoors again. Four months ago: Summer was in full swing. We sat on the patio and listened to live bands playing in the distance. Boats cruised the lake, people roamed the docks, and we discovered that we had adjusted to life on the lake. We had developed friendships with the entire marina staff, learned the ropes, took on the challenges and made this boat our home. Three months ago: Everything changed. Again. We couldn’t have predicted that the worst storm in twenty years would hit our floating neighborhood, severing our dock from the rest of the marina, destroying walkways, sinking boats and causing a mandatory evacuation. We walked away from our home not knowing if we would ever return. Two months ago: We waited for the final insurance verdict on our home. Temporarily homeless, we lived out of suitcases while our future hung in the balance. The insurance company delivered the news: Due to structural damage and damage to the pontoons the boat was totaled. God gives and takes away. One month ago: I wrestled with my feelings and thoughts, trying to make sense of the situation. God spoke to my heart through the story of Abraham. This familiar story suddenly came alive with new meaning. God asked Abraham to make the ultimate sacrifice by giving his son as a burnt offering. So Abraham and Isaac set out towards Mount Moriah where Isaac would be killed as an offering to God. I’m sure we are all relieved every time we get to the part of the story where God stops Abraham. It was a test, after all - to determine if he was fully surrendered and willing to give up that which he love the most. Our adventure continues: We received back via insurance the entire amount we originally invested in the boat, which means we are moving back to land. We’re moving back to a house where my kids will have their own rooms and I will have a bathtub! (It’s the little things.) I look back over this past year and am so grateful for the lessons we’ve learned, the joy we discovered in the middle of a quiet lake and the memories we made as we stepped out and trusted God. In some ways it feels like a chapter in our lives is coming to an end, but deep down I know that this is just the beginning. I was drenched in sweat as I wandered around the houseboat aimlessly. What do I take? How long will we be gone? Lots of questions but very few answers. A wise friend once told me that when you don’t know what to do, just do something, so I started with the refrigerator. I knew all the food would spoil without electricity, so I started there, and so began the process of temporarily moving out of our home. As I walked around and randomly gathered our belongings John assessed the damage from the storm. The first storm had come out of nowhere and hit us the hardest. The dock connecting our houseboat to the rest of the marina ripped in half and caught on fire. Large boats broke loose from their slips and crashed into the shore. Some news channels reported eight foot waves and 80 mph winds, calling it the worst storm in twenty years. Several people had to be rescued from the choppy waters after they abandoned their paddle boards and jet skis to try to swim to land. The storm had come out of nowhere and left a path of destruction in its wake! The marina staff and members were still picking up the pieces from the first storm when another one appeared on the radar. There was nothing anyone could do to stop mother nature, so instead unstable boats were relocated, docks were tied together with cables, and everyone braced themselves for round two. The second wave caused extensive damage to the main village forcing people to evacuate the marina by boat. And just like that our neighborhood was destroyed. Late that night we received the e-mail that there was a mandatory evacuation at the lake and we couldn’t return home. The situation was out of our control and there were no answers, so we took our belongings and moved in with our friends Jeff and Kasey until we could figure out our next step. When we saw a third storm on the radar we decided to drive to the lake. Like a boxer in the final round, barely able to stand, this unstable marina couldn’t afford another blow. Yet we sat at the top of the south ramp and watched as another storm rolled in. The shifting dock came loose and worked its way under the corner of our houseboat, with every wave our boat was getting beat up, twisted and damaged and there was nothing we could do. We continued to watch as the third storm wreaked havoc on our neighborhood. Throughout our life we experience a variety of storms. They come unexpectedly, we do our best to brace for impact, but things are often out of our control. The storms we experience throughout our life can be devastating, turning our world upside down and leaving a path of destruction in their wake. These moments can often be overwhelming and discouraging – especially if our focus is on the dark clouds overhead. Right now we are choosing to focus on the good and trust God. One of the most encouraging things to me in times like these is how everyone comes together to support and encourage one another. After the first storm, when our dock was destroyed, our dogs were on the boat alone. Our friends, Jeff and Kasey, got to the lake before us, so Jeff jumped in and swam through those rough waters to check on our dogs. Everyone in the marina jumped in to help secure dock lines, empty water out of sinking boats, and assist those that had sustained the most damage. Following the storm people learned that our family was temporarily homeless and we began to get offers to utilize spare bedrooms, RV’s, and homes. I love how God’s light can shine right through the darkness. What now? Our boat sustained more than thirty thousand dollars in damage including holes in our pontoons, damage to the outdrive, swim platform and ladder. There is also structural damage that is causing our second story to cave in to our downstairs living room – so if we don’t fix that I could be living in a single story again! The next step is to pull the boat out of the water, which takes modifying a trailer, paying $4,000 and getting in a long line of others waiting to do the same thing. We are unsure when the marina will be functional again, we aren't sure when our boat will be fixed or how much it will cost. There are a lot of questions and the future is uncertain. These storms have turned our world upside down and left us temporarily homeless. Not an ideal scenario with the church launch forty two days away. When I think about the growing to do list, shrinking timeline and challenges ahead I get a bit overwhelmed. So I choose not to think about those things. Instead, I focus on the blessings. I pray for perspective and can see God at work every step of the way. I think about my commitment to follow Jesus, despite the cost, and I keep moving forward. I choose to praise Him in the storm! As I look over the empty lake it’s hard to believe that just a few short days ago thousands of people filled this place. I am still amazed at God’s plan, and how he managed to place us right in the middle of a community that is struggling to find their way. I spent most of my life lost, so there is no judgement, just a passion to build relationships and point people to Jesus. The best way to make friends when it is five hundred degrees outside is to help them cool off. We took full advantage of the extreme temperatures by creating bandanas promoting our September launch, soaking them in ice water and handing them to people that were overheated and desperate for relief. We also passed out popsicles to kids and adults throughout the day. The response was epic. People were shocked we were just giving everything away – no strings attached. The response was so great we went through 500 bandanas and popsicles in just a few hours, so we wrapped up the outreach and headed down to the house boat for the after party. Traveling from the top of the marina to the houseboat with nearly 60 people was quite comical. The golf carts were busy helping others, so many in our crew had to walk. It was slightly chaotic, but eventually everyone made it down to dock 8 where we reside. There were a few casualties along the way, luckily none of which were people. We did, however, sacrifice a wagon full of goodies, electronics, toys, bags, and towels to the bottom of Lake Pleasant. I jumped in to try to save some of our belongings, but unfortunately everything sank pretty fast. One of the downsides to living on a lake is the nearly two hundred feet it is to the bottom – so long go-pro! The rest of the evening was equally as chaotic, because anytime you squeeze that many people into a small space it is bound to be a little crazy. Add the Petri kids to the mix and it’s a circus! Despite the madness everyone seemed to have a great time eating, hanging out, swimming, enjoying the waterslide and watching the fireworks over the lake! In the middle of all the festivities we forgot to move the freezer that we had used for popsicles back to the building at the top of the marina. Instead, it sat where our pop up tent had been, and remained there even when everything else was taken down. I am sure you can imagine our shock when our friends that work for the Maricopa Water District called to inform us that Peoria Police Department thought our freezer was a bomb. I think the tagline for our church should be Reclaim Church…never a dull moment! We wrapped up the night at nearly 2 a.m. by standing with a couple in the marina that was opening up to us about their marriage struggles. They shared their plan, asked for advice, and we prayed together. As we got into our boat and headed back across the lake we noticed a lot of people were still partying. How ironic that years ago that would have been us. Now? We are still up at 2 a.m., but instead of partying we are praying. Instead of getting out of control, we have given Jesus control. Instead of waking up ashamed of the night before and feeling terrible, we woke up feeling joyful and content. This life we are living is a bit unorthodox, almost always chaotic, and completely unpredictable but I honestly can’t imagine it any other way! The Honeymoon phase is the idealistic time in a marriage when everything seems perfect and the future is bright. You easily focus on all the things you love about your partner and can’t imagine your life without them. Sure, people warn you about the potential problems you’ll face in the future, but you’re certain that doesn’t apply to you. All is right in the world, until it’s not. Don’t start sending me counseling resources just yet – my marriage is great! However, I believe the honeymoon phase applies to more than just relationships. Like many marriages that fail when this period comes to an end, we can experience failure in other areas of our life too if we aren’t prepared. However, when it comes to lake life the honeymoon phase is coming to an end. I still love living on the lake, but the reality is some days it is difficult and frustrating. Spiders disrupt my quiet time. The wind rocks my world, literally, making me anxious and queasy. Gangs of gnats linger around the boat just waiting for the right time to attack. The lack of space has left my kids room looking like a hurricane hit the lake and lack of storage has forced me to turn my extra shower into a closet. When you are searching for first aid supplies, extra blankets and colored pencils in your shower you know the honeymoon phase has come to an end. As I navigate these phases of life I’ve learned a few things. First, it’s vital I enjoy the honeymoon phase, while it lasts. I realize there may come a time when our unity is threatened, finances are scary and things feel like they are falling apart. I will pray that God prepares my heart for those moments, but until that time comes I will praise him for the victories we are experiencing each day. Secondly, I will remember that our decision to radically follow Jesus is a daily decision. We read in Matthew 16:24 that we are to deny ourselves, take up our cross and follow Jesus. I will deny my desires for more space and more stuff. I will take up my cross – even if that means dealing with unwanted insects and rough waters. I will follow Jesus no matter the cost. And last, but not least, I will embrace this crazy life because the honeymoon phase may come to an end, but with Jesus, the adventure never will. Church planting is sort of like learning to ride a bike, especially if you are coming out of a mega church. Like training wheels, our ten years on staff at Radiant allowed us to gain the strength and confidence we needed for the journey ahead. A friend recently shared with me that the difficult part of following God is not knowing the end destination. Unlike google maps that conveniently charts the course when we give our starting location and end destination, following God requires blind faith. Faith is trusting God has a plan and obedience is getting in the car even when you don’t know where you will end up..